trailripper - va works pretty good "i ride in Virginia and we have had nothing but rain and mud every weekend so i think it works good but honda bright is the best i found for cleaning the red clay off my white husky .."
Jesse - Washougal, WA Best cleaner I've used! "Been using Simple Green like most people since day one, ran across this stuff at a local race and will never go back. 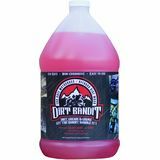 Cuts through grease and dirt better than anything I've used, plus gives the plastics a nice little shine that I've never got from any other cleaner."